I discussed the possibility of picking up this game the other week... and I did! I probably wouldn't have grabbed it if I wasn't looking for something new to check out while I was traveling. In the end I'm happy I got the game. The Mario Edition did such a better job of easing me into Puzzle and Dragons. The demo and the iOS version that I tried last week did a horrible job of teaching me what to do when playing the game. Everything from team composition to special abilities and powering up characters are taught in a friendly and easy-to-learn manner in the Mario Edition. At this point I actually feel like I would probably like the mobile version now that I understand the game better. I would download it again on my phone if it weren't for those F2P mechanics. Just having that stamina bar and being able to buy my way to victory bugs me. But the Mario Edition did away with the things I didn't like and did a great job of explaining the interesting portions of the game. I would recommend it if you have a 3DS and you're a puzzle game fan. There's a lot of entertainment there. And I haven't even touched the entire other game that comes with the Mario Edition. 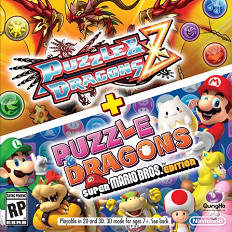 It also has the full game of Puzzle & Dragons Z. I should get around to trying that too.